eCite - Partnerships as Instruments of Good Regional Governance: Innovation for Sustainability in Tasmania? Partnerships as Instruments of Good Regional Governance: Innovation for Sustainability in Tasmania? In Australia and elsewhere, partnerships among various levels of government, business/industry, non-government organizations and communities have become a key strategy in rejuvenating regional economies and improving environmental, social and community outcomes. In time, partnerships may prove to be a crucial innovation in regional governance. However, concerns have been raised that in practice, partnerships may do little to advance regional sustainability, particularly where economic success rather than sustainable development remains the dominant agenda. 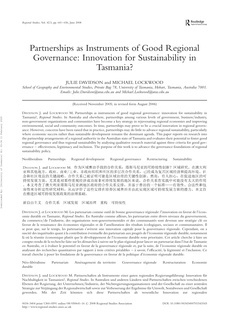 This paper reports on research into the partnership arrangements of a regional authority in the Australian state of Tasmania and evaluates their potential to foster good regional governance and thus regional sustainability by analysing qualitative research material against three criteria for good governance - effectiveness, legitimacy and inclusion. The purpose of this work is to advance the governance foundations of regional sustainability policy.